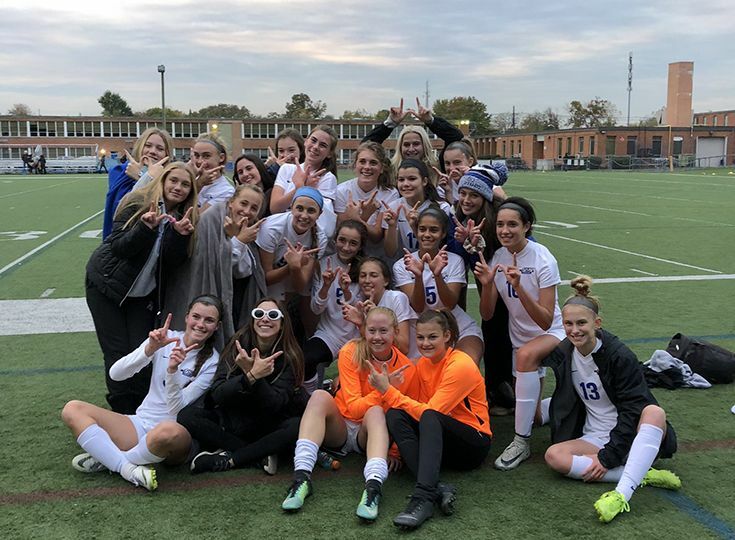 The girls’ soccer team secured the Skyland Conference Mountain Division title for the first time in program history this past Friday, October 26. It is the Knights’ first conference championship since they won the Patriot Conference title in 2007. The race to claim the divisional crown was tight from the start of the season up until the last day of interleague play. Despite racking up wins by large margins throughout the majority if the year, Gill sat behind Rutgers Prep in the division standings due to a 2-0 loss to the Argonauts on September 11. However, the Knights were able to secure a crucial win over Rutgers Prep on October 2 to leapfrog into the top spot in the standings. The two teams would remain neck and neck for the remainder of the fall with the division champion being determined on the last day. Gill entered its contest against Immaculata on October 26 with a 12-1 record within the division while Rutgers Prep had already played their 14th and final game of the year and owned a 12-2 record. The Knights needed to either win or tie their match to win the title outright. This was a tough task for the Knights, as not only did they have the pressure of earning their first conference title in 11 years but Immaculata was the only other team in the division with double digit wins. The Knights were able to rise to the occasion, however, as they tied the Spartans 1-1 thanks to a clutch goal from Hayley Goldin '19 with the assist coming from Samantha Lowe '20. Teresa Zimmer '20 was great in goal as she made 13 saves to keep it a tied game. Gill’s strong record not only earned them the conference title, but also has them ranked second in the upcoming North, Non-Public B Sectional tournament. The Knights will host the winner of the Newark Academy/Morris Catholic game on Friday, November 2.